What is service? 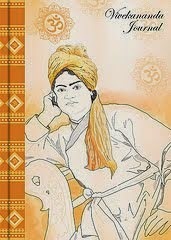 That service is the best and the noblest, which is performed with the attitude of total surrender to God. "He has endowed me with all the possible capacities and I must utilize every mite of the energy, power, intellect, strength, and all other possessions to the best of my ability for the glory of my SELF. It is the divine design that I should render service on His behalf. Recently a visit to Dr Hedgewar Hospital in Aurnagabad was eye opening. Here Seva is performed with the attitude of God's instrument. The very novel idea that has been worked in the Hospital is 'SEVAVRATI'. People above 50 years who have either taken VRS or Retired are offering their services to the patients in the Hospital. The patients come from Rural Areas who do not know reading, writing. Coming from village in the big city is another difficulty as they are new to traffic, people and their behaviour. They need support, confidence, somebody of their own. And these Sevavratis do all the roles that the patient is in the need. Taking them to Dr., after check up, bringing medicine, giving food, talking and confiding with them, checking blood group, etc etc.... a number of works indeed. When a patient is taken to operation theater, all that goes inside the theater is conveyed to one's kith n kins so that they remain assured that their relation is being taken care. Some wonderful incidents also happen. A grandmaa wished that before her death she should see her granddaughter married who had accompanied her. She expressed this to Sevavratis. They immediately found alliance, got her married and the grandmaa attained immortality with all happiness and satisfaction. The Sevavratis - around 90 in number - treat themselves as God's instruments. They render services on behalf of the Divine. They bring their tiffin, work almost 12 hrs, do not take a penny, and Serve with Seva attitude. If sick, they stand in Q, pay amount and take medical assistance from Hospital. Him but that you may help yourself. Do you think even an ant will die for want of your help? Most arrant blasphemy! We have to play our role in this world gymnasium with all vigour and enthusiasm. The action must be performed without any attachment but sincerely and honestly to the best of our ability and with an attitude of being a tool only. Infuse the Team with the mission: Have Faith in the basic goodness of all raise them to the higher objective then the best in others get manifested. No work is possible in this world single-handedly though a single person may give the lead and make it possible. But always there are collogues, supporters, well-wishers whose contribution is required to actualize the goal. For that a leader must have faith in the basic goodness of all, should raise them to the higher objective for which all are working and then the best comes out of them. Eknathji could secure the support of stone workers who worked even when they were not getting salary as the flow of donations was yet to be picked up. 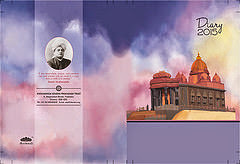 Almost all state governments irrespective of the party they belonged to donated Rs one lakh each, the people of India through one rupee donation contributed Rs 85 lakhs, actually the whole nation rose as one and was imbued with the mission of building me- morial to Swami Vivekananda on the rock. It became a national memorial. The whole nation rose as one to build the memorial and won in the process and so even won in the war. 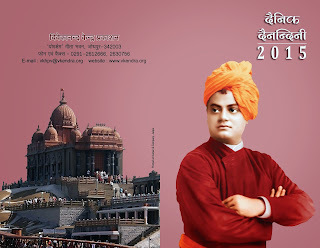 Since the celebration of Swami Vivekananda's Birth Centenary, his message again galvanised the nation. The meeting of MPs for help in getting permission for the memorial and the collection campaign helped in spreading the message of Swami Vivekananda. Therefore, it was not just a co-incidence that after the Rock Memorial was completed in 1970, the war that India had to fight in 1971 brought spectacular success to our Motherland. In India, every change always follows the spread of spiritual message. Bringing whole nation together to build this grand Memorial was a unique service that Eknathji did for the nation. It strengthened the national will. It proved that we could come together and work for a national cause. 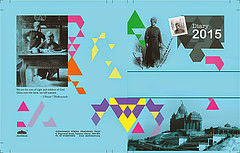 Paramacharya of Kanchi Kamakoti Peetham Sri Chandrasekharendra Saraswati recognized the real import of this work by Eknathji. It seems that he said whether government recognizes these services or not but he would like to do it. 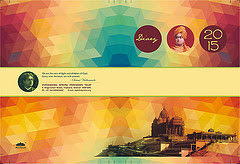 He specially sent his successor Shankaracharya Sri Jayendra Saraswati to Kanyakumari to honour Sri Eknathji. Sri Shankaracharya conferred the title of "Bharat Seva Ratna" on Eknathji and honoured him. Sri S. K. Achari was honoured with the title "Shilpa Kala Ratna". If you win but the society, nature etc loses then ultimately you also lose thus so many examples of so called successful people feeling dissatisfied, depressed or even commit suicide. By going to court, by protest marches etc Eknathji could have also built the memorial. But that would not have given satisfaction to any. If you win and the society also benefitted then alone it is a win-win situation and that gives you a deep sense of fulfilment. Actually your achievement becomes a stepping stone for further progress of man. 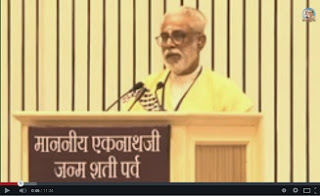 That is what Swami Ranganathanandaji who later became the President of Ramakrishna Math and Mission had said about Eknathji that, "A man like Eknath Ranade is an asset to any movement in any country. I have known him very intimately, and I have admired his energy, his quiet dedication, his capacity for calm, silent, team-work and a rare capacity to influence favourably persons and every intractable circumstance! No difficulties can thwart him. Mountain-high obstacles he will face with a calmness and gentleness suffused with determination. In the meaningful words of Sri Ramakrishna: the Kacca ami, unripe 'I' or ego, has been replaced by the Paka ami, ripe 'I' or ego. With him and his other dedicated colleagues behind the movement, it can look forward to a rich harvest of useful work for the good of man". Now just reading these six points as mentioned above one cannot acquire them. One needs to have clear vision of life, intellectual convictions, emotional connections and actual experience of practice to become masters in these six dimensions. How do we get this vision of life, intellectual conviction and emotional connections to the mission of our life? What for do we live? We shall try to understand these in the light of Eknathji's reflections and actions in the succeeding articles. 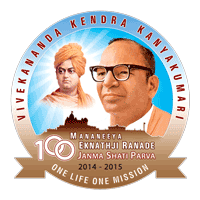 Vivekananda Kendra is celebrating the Birth Centenary year of Mananeeya Eknathji Ranade, the Founder of Vivekananda Rock Memorial and Vivekananda Kendra, Kanyakumari. The celebrations from 19 November 2014 to 19 November 2015 would be with the motto "One Life One Mission" - a chosen maxim of Eknathji. He was a great person in whose dictionary there was no word as 'impossible'. He used say that life should be like an arrow hitting the target. How? A new series of articles for one year titled "One Life One Mission" is being started for the very purpose. How did Eknathji achieve this Win - Win Achievement ? We can speak volumes about it. But shall see it in few points. Clarity of purpose. Many times we are just not sure what we want to do and we keep options that if this does not work out then I shall do that etc. Even when there was such stiff opposition Eknathji envisaged a grand memorial on the Rock. And he ensured that all those engaged in that work also had no doubts about it. The whole universe is interconnected – if we are focused, convinced then the favorable changes, movement takes place in cosmos to actualize our objective. Attitude matters! And our attitude is our choice: Whatever may be the problems they cannot be solved by withdrawing from them. We have to face them. But while facing these difficulties our attitude should also be inclusive ie understanding and accepting the opponents. Inclusiveness does not mean that you should give up your dream but give up your negative attitude even about those who stop you, oppose you. Address to the goodness in others. We should not burn your bridges with them – they may become our best supporters in the future. That is what happened in the case of Eknathji - all the per-sons – the union minister who was opposing, the Chief Minister Sri Bhaktavatsalam and the local people all became admirers of Eknathji and enthusiastic partners in his mission. Remember, our attitude is always our choice! Cordial Relations with all: We have to remember that the people around us become conduits for cosmic power to reach us so we should keep cordial relations with all. Eknathji could collect the signatures of 323 Members of the Parliament within three days! When so many MPs - all most all present in Delhi at that time - belonging to all regions, religions, communities signed the memorandum requesting for the permission for the Memorial on Rock, which popular leader can reject it? Actionized Patience: Memorial got the permission but there were still many difficulties. Success does not come by avoiding difficulties. Success comes from transcending difficulties. When whole nation desires the memorial it could not be a mere statue encased in 15 feet by 15 feet room. But that is what the Chief Minister had told. But Eknathji had actionized patience – it means he would have patience to wait for the right moment or right decision but he would not keep quiet. He would go the root of the problem, would have all the background information to act upon and patiently wait for the right moment. Eknathji met Paramacharya ie– Shankara-charya Sri Chandrashekhrendra Saraswati as he knew that Sri Bhaktavatsalam highly venerated the Paramacharya. Paramacharya took keen interest and called the traditional Sthapati Sri S K Achari to make design for the proposed memorial. With that design Eknathji again came to Sri Bhaktavatsalam who told, 'Paramacharya has approved it so you go ahead with it.' Thus 15x15 memorial became 135x94! Dynamics of Time and Energy: A person who wants to achieve something has to know the dynamics of time and energy. We see the youth wasting their time in many meaningless things. Many friends of Eknathji told him that, "Such a grand memorial how can you build? How will you transport the stones to the rock? From where the money will come? Your life would be spent on this.?" But Eknathji knew the secret of time and energy. Eknathji used to say, One Life One Mission! Life should be like an arrow without going here and there it should hit the target. And really Eknathji saw to it that such grand memorial costing one crore 35 lakhs in those days got completed in record time of six years. "The main theme of my life is to take the message of Sanatana Dharma to every home and pave the way for launching, in a big way, the man-making programme preached and envisaged by great seers like Swami Vivekananda." For downloading MEJSP Material you can click on the given link above & navigate required folder & download specific Material. One can also copy entire google Drive folder by clicking on right-top "Add to Drive", and all items will be copied to your Google Drive.